The tempo picker is displayed when a tempo is required to play the metronome, when tapping and holding on the metronome live bar button, or when settings the tempo using the Metadata Editor in the Song Editor. 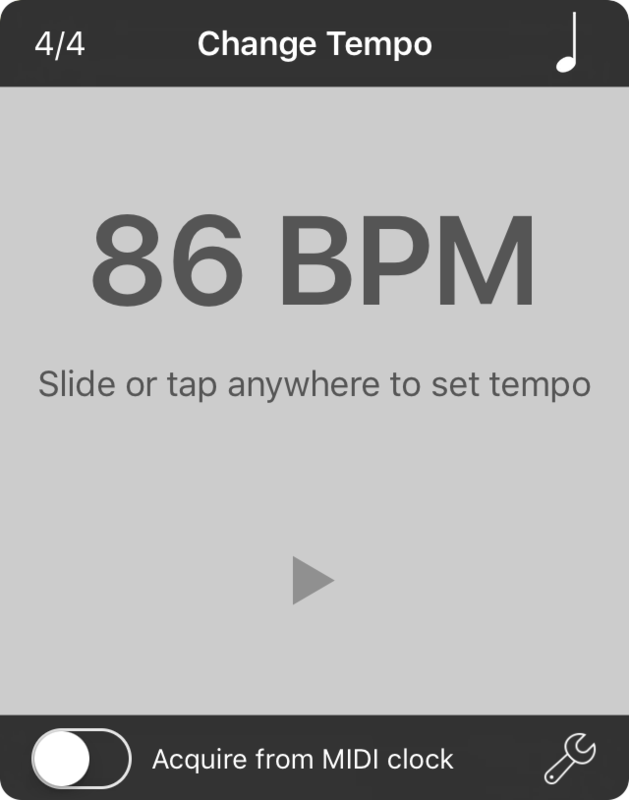 It allows you to set the tempo in beats per minute (BPM). To change the time signature, tap on the time signature in the upper left corner to display the time signature picker. OnSong uses the 4/4 time signature by default. The metronome defaults to quarter note subdivisions. Tapping on this icon in the upper right corner will cycle through subdivisions including: whole note, half notes, quarter notes, eighth notes, eighth note shuffle and sixteenth notes. If you have a compound time signature selected such as 6/8, 9/8 or 12/8, the quarter note selection will be a dotted quarter note. You can change the audio and visual attributes of the metronome directly in the metronome live bar menu by tapping on the wrench icon in the upper right corner. This will open a screen containing metronome settings. You can then tap Done to apply those settings, or tap on Cancel to close the screen without saving changes. To set the tempo, slide your finger to the left and right to decrease or increase the tempo in broad strokes. Tap on the left/bottom or right/top of the picker to decrease or increase the tempo by one beat per minute. Alternately, you can tap in the middle of the tempo picker to tap the tempo of the song. The time signature is taken into account when tapping the tempo to handle compound time signatures of eighth note timing. Because playing the metronome should be immediate when tapping on the live bar button, tapping and holding the button will cause the metronome to start playing. This is by design since to determine if a tap has been held requires the operating system to wait to determine the type of touch. The tempo picker includes a play/stop button that allows the metronome to be started or stopped. This can be used to stop a playing metronome for settings a new one, or to check the tempo once a BPM has been selected. The tempo can be adjusted between 40 and 200 BPM. If the tempo is set below the minimum BPM, it is set to None, removing the tempo from the song. The minimum and maximum BPM can be adjusted in BPM Settings found in Settings » Live Settings » Metronome » Audio Settings » BPM Settings. If you have enabled the MIDI add-on, you can acquire the tempo by listening to a MIDI clock. The MIDI clock is sent from hardware and software to allow multiple MIDI devices to remain in sync with one another during tempo shifts. Turn this switch on to set the tempo. When finished, turn the switch off to retain the acquired tempo.